King Sized Bed Archives | King Rentals, Inc.King Rentals, Inc. This one bedroom unit is located on the second floor of Ocean Park South. G-16 is a corner unit with a private balcony area, friendly community pool, and barbecue area. The interior of this condo is very modern. A beautiful fully equipped kitchen with all white appliances through-out. This unit has a very sleek look with wood flooring as well as tile and laundry facility on site. Truly an excellent location near all common amenities, shopping, dining, and entertainment. 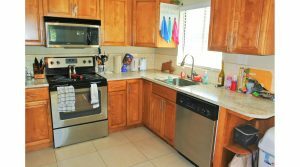 Beautifully remodeled fully furnished unit just a short walk to the ocean. This bright corner unit has been recently remodeled. Enjoy the best of Florida’s weather on the screened patio. Keep your bike or surfboard in the secure storage. Near area shopping, dining, services, amenities, major thoroughfares, a short drive to Orlando, Kennedy Space Center and more! Find your beautiful beach getaway here! Unit 211 is a 2nd floor, direct ocean unit with an enclosed balcony overlooking the ocean, and views from the living, dining, and master bedroom. The kitchen has modern finishes and stainless steel appliances and opens into the dining nook with a large bay window and balcony access. The balcony can be opened up to enjoy the fresh sea breezes, or closed on cooler nights. Enjoy all the amenities of home with a fully equipped kitchen, large living room with a flat screen TV, and king sized bed in the master. 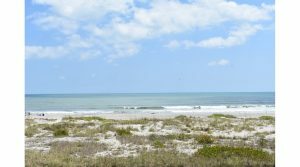 Conveniently located near Downtown Cocoa Beach and surrounding Space Coast areas, local amenities, and just a short drive to Kennedy Space Center, Melbourne, and Orlando. This spacious and modern 3-bedroom, 2.5-bath townhouse is located in the quiet northern neighborhoods of Cape Canaveral. There is plenty of room for the whole family here. Abaco is within walking distance to Cherie Down Park, a local favorite and a nice public beach access with bathrooms and showers; biking and walking along Ridgewood Avenue’s pediway; and fast access to Port Canaveral. 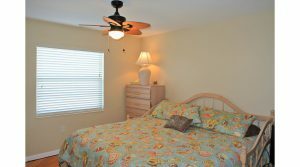 The master suite has a king sized bed, a private balcony, and an on-suite bath with a garden tub and a walk-in shower. The second guest bedroom has a queen sized bed, and the third guest bedroom has a full bed and a twin bed. The fully equipped kitchen has beautiful granite countertops and modern, stainless steel appliances, and opens into the dining and living room. This beautiful townhome is the perfect home away from home! 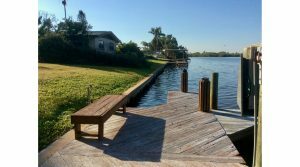 This beautifully remodeled riverfront home is located in the heart of Cocoa Beach near downtown and Minutemen Causeway. Enjoy your own private dock on the Banana River with easy access to the Thousand Islands which are home to thousands of fish, birds, and wildlife. 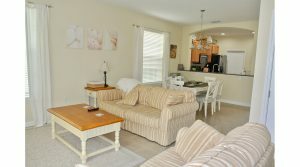 The property features in-unit laundry, an open floor plan with bar seating in the kitchen and a formal dining area, spacious living areas, a private two car garage, a large backyard, and a Florida Room with a ping-pong table. The master suite offers a king bed and a private on suite bath.